Want to find the best dental products for your dog? Then you're in the right place! Did you know, that over 80 percent of all pets will have some sort of periodontal (around the tooth) disease before they reach year three of their lives. "How should I do the cleaning?" "What are the most powerful products for the job?" "What kind of toothpaste should I use?" In today’s post we’ll reveal the proven ways on how to clean dog's teeth properly. If you want too keep your dog's mouth hygiene - you’ll love this guide. Although there are tons of chew sticks and brushing alternatives, nothing can replace the actual thing. To keep your dog’s teeth healthy, you need to invest in regular checkups, professional cleanings, and daily oral care. This will raise your dog’s chances of keeping a healthy mouth and keeping you a happy owner, because the longevity of his or her life has also just increased, too! Go to the vet for regular checkups. Not only does this help with your dog’s overall health, but it also includes his or her oral health. If a periodontal disease is building up, your vet can spot it — before it gets worse! Go to the vet and get your dog’s teeth professionally cleaned—at least once a year. This one-time annual visit can prevent the buildup of tartar and plaque, minimizing the risk of gum disease. 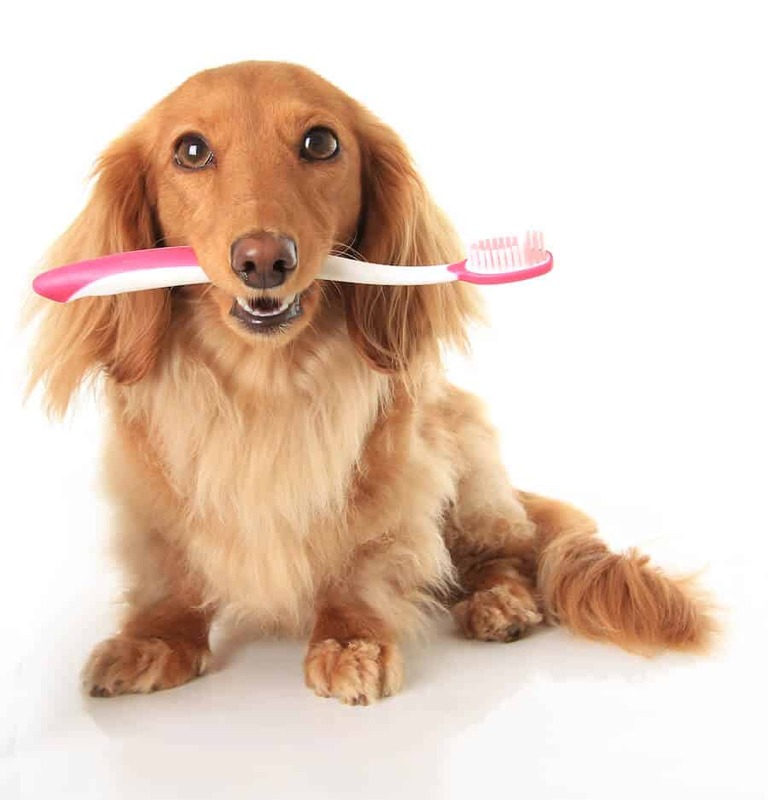 Brush your dog’s teeth daily—if you can—or at least as often as possible. Even if you don’t brush their teeth every day, still do a routine “inspection” for plaque and tartar buildup, inflamed gums, and broken teeth. When brushing, use a soft-bristled, dog-specific toothbrush and toothpaste—please see below for our recommended ones! Be gentle on your dog’s teeth! Aggressive brushing can cause the gums to become inflamed. Offer praise—to your dog, not their teeth! This positive affection can keep your dog behaved and calm. Even if you're in a rush, take the time to go slowly. Brushing their teeth might be extremely uncomfortable for your dog—especially in the beginning, so it’s extremely important that you try and make ease that panic. Reach all the way back and get ALL of their teeth—especially the molars in the back. If your dog’s gums are bleeding, a little might be okay; however, if it gets to be excessive, you might want to see your veterinarian. Even though you might be getting frustrated, don’t force your dog to open their mouth or hold them down. This will make the whole situation more “painful” for them and undesirable. If you're just getting the outside of your dog’s teeth than that’s also okay. It should have breath control as one of its main features. Ready to brush your dog’s teeth? Probably not but it’s better now than never! Here are our best types of toothpaste and dental cleaners to get your dog’s mouth and oral hygiene to the cleanest of cleans. For a toothpaste that is specifically formulated for pets and still has the fighting power that can help control plaque and fight bad breath, the Petrodex Enzymatic Toothpaste is an excellent choice for a flavored toothpaste that can lessen the burden of brushing. Since it has a poultry-flavored taste, your dog will be more likely to enjoy brushing and ease the task. You also don’t have to use a doggie toothbrush if you don’t want to! Especially for dogs with small teeth, you can apply the toothpaste with a small piece of damp gauze bandage and use your finger to get it around. This toothpaste can soften and loosen the tartar build-up—especially on the back teeth! Even if you think there’s no hope for that deep-set tartar, this toothpaste can get it out! How does it work miracles? Because it has more enzymes than any other brand out there. + It has a cleaning power that reaches much deeper than other kinds of toothpaste, removing plaque and tartar, almost immediately. + The enzymes in the formula target and break down the plaque, which takes care of bad breath. + Dogs love the poultry flavor. + The sweetener that is in the toothpaste is sorbitol, which is safe for dogs. + There are no food colorings that can cause cancers. - It runs at a little higher cost than the average dog toothpaste. Coming in packages of six or three, you can easily stock up to take care of your dog’s teeth as best as you can—for an affordable price. The Pet Republique Toothbrush has soft bristles, making it more comfortable for your pet during cleaning. You can also use the Mini size for smaller or younger pets to get used to brushing. Especially if your dog wants to chew on the toothbrush that’s trying to clean him or her, this dog finger toothbrush is a perfect way for you to keep control of the situation and still get his or her teeth clean. With quality and quantity, the toothbrushes are made from food-grade materials, are FDA approved, and are effective, reducing the risk of dental disease and eliminating tartar and plaque build-up. + With every purchase, the brand donates 15 percent of the proceeds to the American Animal Rescue Society. + They run in small enough sizes for tiny dogs and young ones. + The small size also makes it great for getting in between the teeth. + If you have multiple dogs (or cats) the package comes in a variety of colors so you can differentiate whose brush is whose. + They are flexible brushes which makes cleaning much easier. - Stronger bristles than most brands so you need to be more gentle. - Need to get the proper size for your finger. 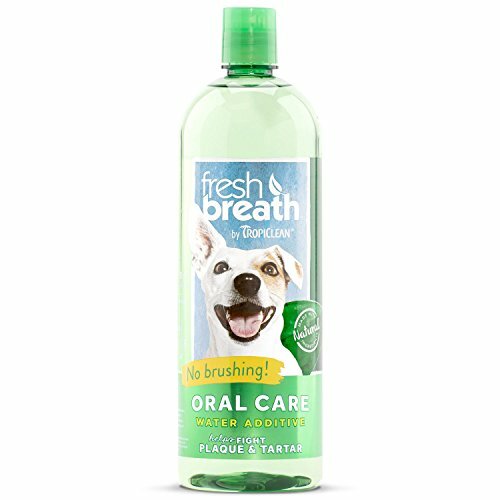 If you can’t stand your dog’s breath and yet have brushed endlessly and religiously every day, the puppy breath in a bottle can freshen up your dog’s stinky breath! The spray also eliminates tartar, plaque, and gum disease. Although it is more effective to brush, this product still reduces the risk of oral disease. 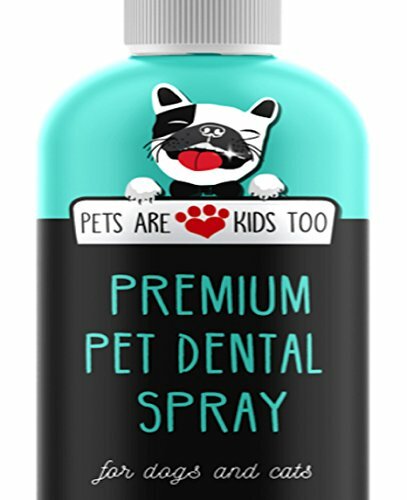 The Premium Pet Dental Spray contains all-natural ingredients that are extremely safe for your dog. With antiseptic properties, the product cures the problem at an enzymatic level. The product is also much easier to use than brushing—simply add three to five sprays in your pet’s water bowl or/and spray directly into their mouths. + A large portion of the proceeds of the profits of this product goes to the “Indy Fund”, which is a foundation for pets with cancers. + It contains natural ingredients, is 100 percent hypoallergenic, neem oil-free, and non-toxic. As a dental spray, it is also alcohol-free. + Best used between brushing and to fight bad breath. - Is not a replacement for brushing and may not work to get rid of tough plaque and tartar buildup. Especially if your dog is a chewer, this toy is the perfect product to keep them busy but also help practice good, healthy oral hygiene. Although it’s not a replacement for brushing, your dog is going to chew on things anyway, so you might as well make it productive. The tough, durable nylon bone that it’s made out of keeps your dog busy and can stand the test of time—even for the most avid of chewers! The toy is designed with nubs and ridges that help clean the teeth and get into the grooves between them where plaque and tartar might build up. If your dog’s teeth are sensitive, you can also get the smooth ring that doesn't have the bumps and ridges. Not only is it effective—lasting sometimes even six months, dogs love the Medley flavor. This is a perfect choice for your dog if he or she is an aggressive chewer. + The round design is easy to grip (for you and your dog). + The flavor is pleasing to dogs, which will make them want more. 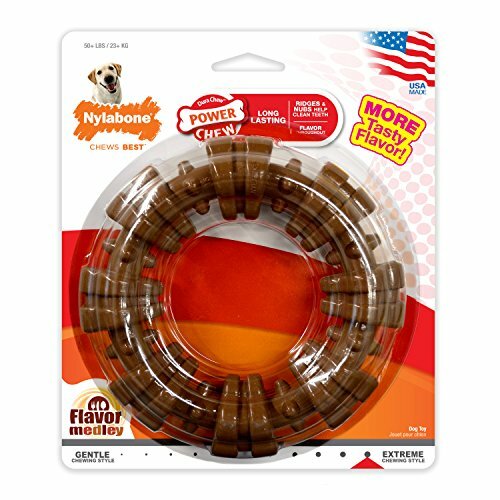 + It lasts up to six months, even for powerful chewers. + It is available in a smooth version or textured with ridges—depending on what your dog needs. - It is pretty heavy and large so might not be the best purchase for a small or young dog. These dental chews are a great “treat” to give your dog that can please them but also please you—and your vet at checkup! Designed with an easy-to-hold Z shape, these chews can be given to your dog at home or on the go to take care of their oral health. One chew daily can reduce plaque and decrease tartar incrementally. It also can freshen your dog’s breath—and you don’t have to do anything. If you are looking for a simple solution to give your dog to freshen breath and improve dental hygiene, these dental chews can be your solution. 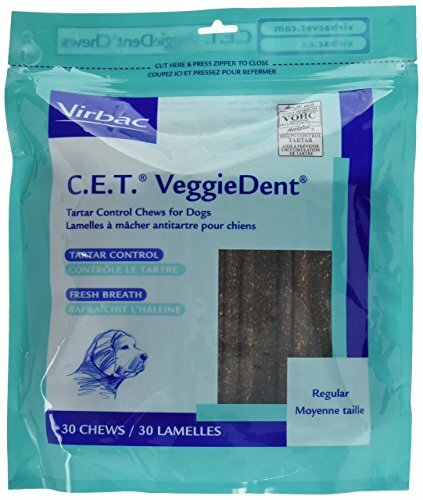 Although they don't and shouldn't replace brushing, they are a great alternative for treats to help keep your dog’s breath under control and keep the tartar down in between brushing. + Since the bones are larger, you can easily break them in two and give half to the dog at a time, which increases their value—making them last longer on your shelf. + The dogs love the flavor. 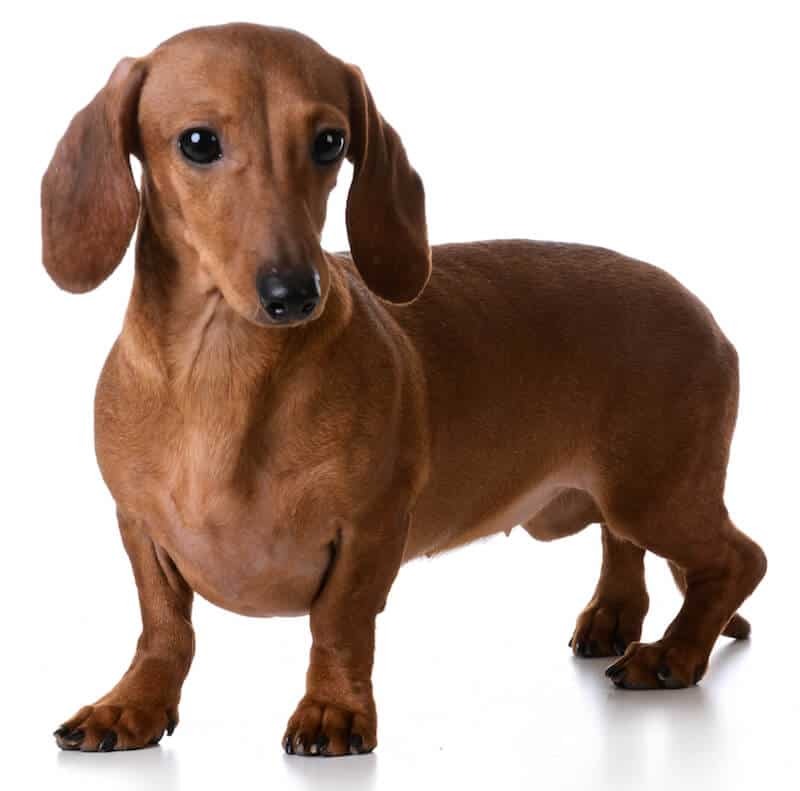 - Since their size in nature is pretty big, it might not be best for small or tiny dogs but can easily be broken off into smaller pieces. 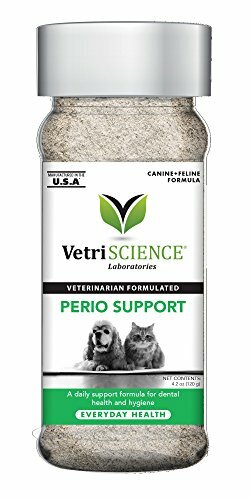 Simply pour a bit of this into your dog’s water and have them lap it up—this can be what fighting tartar and plaque looks like! With a natural green tea flavor that dogs tend to love, you can easily help your dog practice good oral hygiene with this all-natural water additive. The Tropiclean Fresh Breath Pet Water Additive helps reduce the bad odor coming from your dog’s breath and helps fight against periodontal disease. With its all-natural ingredients, this water additive is not only safe and healthy for your dog, it is also veterinarian recommended to combat bad breath—even for up to 12 hours at a time (of course, that depends on what your dog eats in those 12 hours!). The package that Tropiclean uses is also 100 percent biodegradable, which just adds to the health of this product. + Contains all natural ingredients AND packaging! + With just a capful added to your dog’s water, you can keep their teeth clean and breath fresh. + Improves dog’s bad breath and can be used safely for puppies and smaller dogs. + Will help manage and decrease the costs of dog dental care over time. - It isn't extremely effective in removing plaque and tartar—doesn’t replace brushing. - It takes a bit of time for your dog to get used to it—or they might flat out reject it. By simply sprinkling the powder on your dog’s daily dish, you can help your dog practice good hygiene. This powder helps prevent plaque from forming and sticking to your teeth—which is helping to stop the bad oral hygiene problem in its tracks before it even begins! It also attacks and eliminates the bad breath before it even begins by going right to the source—your dog’s gut. The probiotics that are in the powder fight against odors from the inside out. This also doesn't eliminate the need for brushing but can definitely help improve your dog’s oral hygiene in a resourceful way—trying to eliminate that bad breath before it even begins! The powder contains natural zeolites, which don't allow that plaque to stick to the teeth. It also has probiotics, which balance out bacteria in your dog’s mouth, and zinc, which promotes gum tissue health. + Extremely easy-to-use and gentle on the stomach. + It is effective in eliminating the source of bad breath. + The dogs seem to love the taste. - Great to fight bad breath but doesn't replace brushing. These dental wipes are definitely an interesting alternative to brushing teeth. Although they have a “tasty formula” that most dogs tend to love, you do have to get right in there to clean their teeth. Therefore if you're okay with the workload, then you'll be okay with these wipes. It cleans teeth and gums by fighting the plaque build-up. It comes in a package of 90, which means that you will be saving money in the long run. This is a perfect option if you are a dog owner whose dog does not like the toothbrush or would lick off the toothpaste before you even begin to brush. 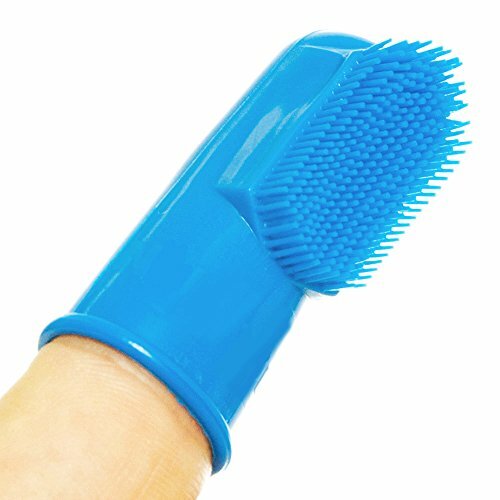 This is also a great alternative for brushing dog teeth if you have smaller dogs and the brushes are just too big for their tiny teeth. 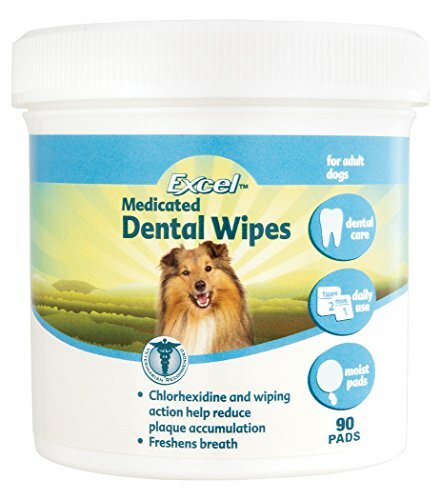 + Great for dogs who normally have issues with the toothbrush. + Dogs usually don’t mind the action of swiping and wiping. - The wipes are small, so might not be best for a bigger dog. Can my dog have good oral care without brushing? We know that you probably want to avoid brushing at all costs, but honestly, there’s nothing better. You can always complement brushing with any of the other options, especially if you're short on time! However, none of these other options is a direct substitution for brushing. Just like with human teeth, your dentist recommends that you practice good, consistent oral hygiene—and so does your dog’s vet! A daily brushing routine is the best way to prevent the possibility of tooth loss, to eliminate bad breath, to fight against tartar and plaque buildup and to reduce the risk of your dog getting periodontal disease. The best. Period. You can always add in other practices, but brushing is unbeatable. How often should I take my dog to the vet for oral care? Just like you, as a human, should get regular, thorough cleanings annually (or semiannually), your loved dogg-o is the same! Taking in your dog once a year to receive a thorough cleaning and also a dental exam where they determine if any periodontal diseases are developing (or if anything else is possibly going wrong), a routine checkup is 100 percent necessary! The deep cleanings performed at the vet can help preserve the teeth as best as possible by reducing the buildup of tartar and plaque. This buildup can lead to periodontal disease and then a loss of teeth. Although you might be paying a bit of money to get your dog’s teeth cleaned, it’s an investment definitely worthwhile. 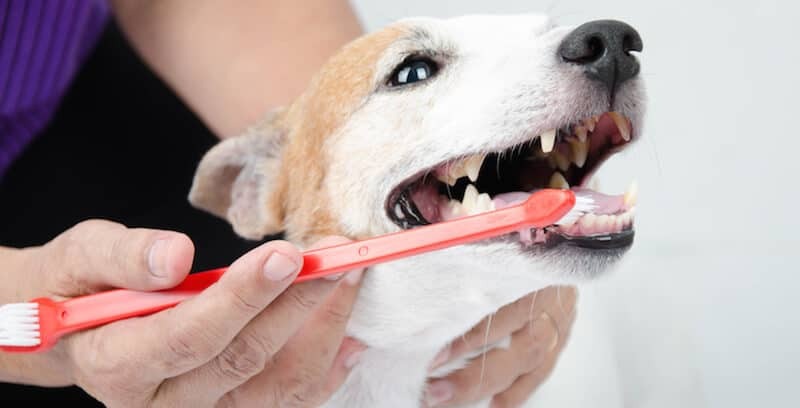 If you also invest a bit more—time and money—in your dog’s daily oral care, the cost at the doggy dentist will definitely be cheaper in the long run! We hope that this guide has helped you navigate through the ins-and-outs of dog teeth cleaning and introduced you to a few worthy products that can help your dog towards good oral hygiene!